After a very rainy month of May, June has started off with warm temperatures and more gorgeous weather to follow in the long-range forecast. Temperatures will be in the mid-70s over the next 10 days, with plenty of sunshine and blue skies. It’s definitely feeling like summer is here! May rains have turned foliage and fauna bright green, and wild flowers are beginning to bloom in the hills and meadows with snow covered peaks in the background. Summer is my favorite time of year in Mammoth Lakes. I remember years ago, it was all about winter and skiing for me. After living in Mammoth for almost twenty years, I have come to appreciate all four seasons and what each one offers. Each season brings something special: Spring brings blooms and the return of the birds singing, summer brings flowers, lush landscapes and herds of deer around town, fall brings vibrant colors and the anticipation of ski season around the corner, and winter brings the excitement of snow and skiing/riding the mountain. Summer in Mammoth Lakes is a special time of year, which attracts more and more visitors each year. 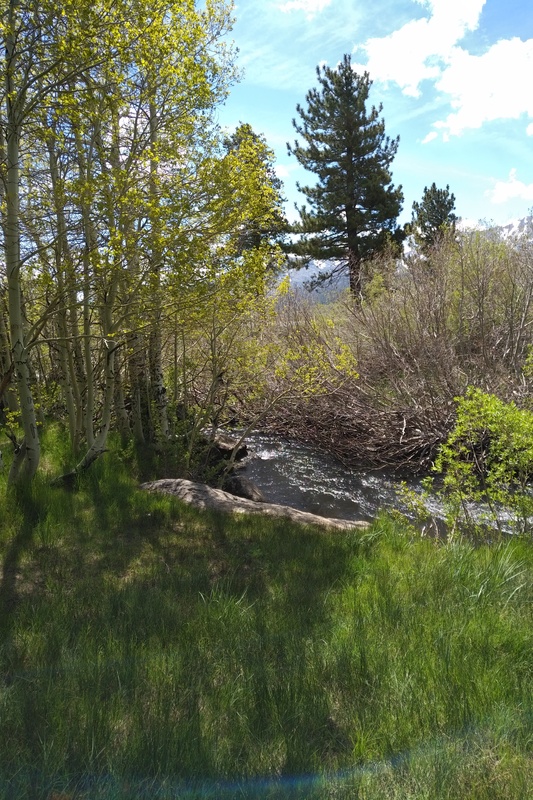 The hiking, mountain biking, fishing, golf, tennis, summer festivals, and of course, the breathtaking scenery and pleasant temperatures are some of the reasons why people enjoy coming to Mammoth during this short season. There is something so peaceful about being in nature and experiencing the scents of the plants, hearing the birds singing, seeing the deer and having a chance to slow down the busy and hectic pace of everyday life. As the metropolitan areas of California continue to see a growth in population and traffic, it seems that more people are drawn to the outdoors and connecting with nature. Mammoth Lakes summer tourism has been on the rise every year, which is a win-win for tourists and the local economy as well. In a previous blog post, I had mentioned that Canyon Lodge was going to undergo a major remodel by the Mountain’s new ownership, Alterra Mountain Resorts. It seems that although the remodel is currently underway, it will not be as extensive as they had originally planned. The season lockers will apparently remain. 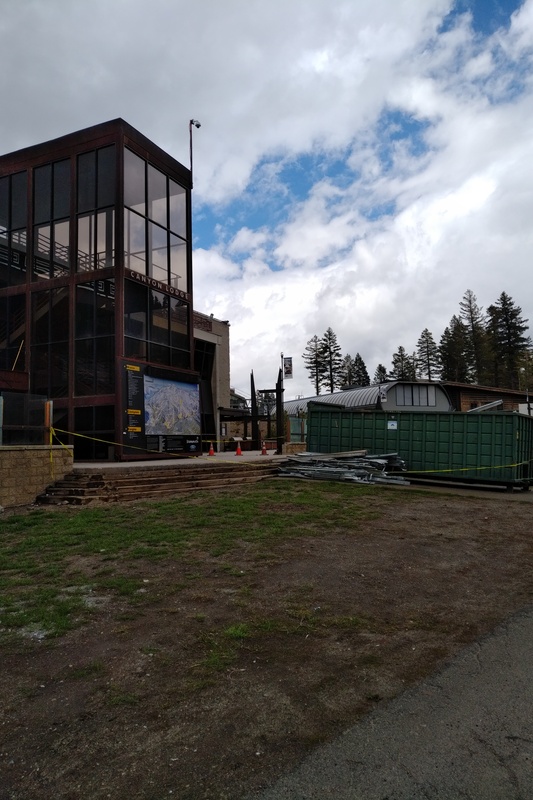 I drove by the other day to take some photos from the outside of the work in progress – not much visible, a few dumpsters located at the slope side entrance to Canyon Lodge and hard to see what exactly they are doing. Canyon Lodge definitely needed some renovations and added dining options to accommodate the high volume of crowds during peak ski season weeks and holidays. It will be interesting to see the finished product unveiled when Canyon Lodge reopens for the season in late November or December (depending on snow). Nothing has been said regarding the much-needed removal of the “tent” at Eagle Express or other areas of the mountain that could use some improvements, namely The Mill Café at the base of Gold Rush chairlift and also the Main Lodge (which could use a complete overhaul). It is promising that Mammoth Mountain is now owned by a true dedicated ski resort operator who understands the importance of efficient operations and amenities for skiers. Since the new ownership is still very fresh, I’m sure it will take some time to plan, strategize and implement any major development to the ski area and on-mountain lodges. Time will tell. In the meantime, inventory continues to remain rather low compared with the lackluster years of real estate in Mammoth (between 2008 – 2016) when condo inventory during the late spring would reach well over 150 active listings and peak during late August. As of today, we have 82 condos, 34 homes and 49 lots on the market (in Mammoth Lakes). The condo and single-family home inventory is very low for this time of year. When prospective buyers used to ask me what the best time to buy real estate in Mammoth was, I would often recommend waiting until the spring, as traditionally, inventory would rise substantially and there would be little competition (therefore offering a chance to negotiate and get a better price). This dynamic has changed, which began last spring. We continue to see a trickle of new listings come on the market, which quickly go under contract (some with multiple offers) even at higher prices. The Mammoth real estate market was a strong “buyer’s market” for several years and now appears to be entering into a “seller’s market”. This is not a widespread dynamic, but more or less sporadic depending on the complex or specific residential property. Highly upgraded homes with views and in resort neighborhoods are commanding higher prices. This is especially true for homes that are walking distance to the Village at Mammoth. Developments like the Village (Grand Sierra Lodge, Lincoln House and White Mountain Lodge), The Westin or adjacent condo developments are commanding higher prices with healthy demand. This has been especially true of the two-bedroom condos at the Village at Mammoth. About a year or so ago, the two-bedroom condos at the Village were selling in the mid to high $400,000 range. Recent sales at Lincoln House for the two-bedroom floor plans have been in the low to mid $500,000 range, with the highest price paid for an oversized unit at $710,000. That is a significant increase in prices compared with a couple of years ago. The three one-bedroom closed sales at the Village were located on a top floor and/or highly upgraded with strong rental income history. Most of the buyers who are looking to purchase at the Village are investors that expect some kind of return on investment, while also having the opportunity to enjoy the condo during off-peak periods. So, if the numbers don’t make sense from an investment stand-point, it is understandable that some of the less desirable units at the Village with higher prices and lower income history would sit. Currently, there are four one-bedroom units listed for sale at the Village, all of which are priced between $429,000 and $445,000. They are not selling, which is odd given the comparable sales over the past year and strong income that one of those units has. Grand Sierra Lodge 1424 is a top-floor unit that grossed $61,193 in 2017 with a lot of owner use. Priced at $429,000 and with such strong income, this would be my top-recommendation for an investor looking for a decent return on investment. Although the Hillside Highlands development being built directly behind this unit might take away some of the forest setting, the top floor location will get requested more than units on lower floors. We are beginning to see more “condo hotel” lenders entering the Mammoth Lakes resort market and offering financing on units that meet the minimum requirements. Condo hotels like the Village units must have at least 500 square feet and have a “true kitchen” in order to qualify for a loan. All of the actual Village units that are at least a one-bedroom in size will meet these requirements. However, the Westin units that are smaller than the two-bedroom floor plan only have a “kitchenette” and will not qualify for a loan with a condo hotel lender. For the time being, prospective buyers looking to purchase anything smaller than a two-bedroom at the Westin will need to come in with cash or secure private money financing. This makes the smaller units (one-bedroom) at the Village more attractive due to the ability to finance. I am including a link to view all active Village and adjacent condos (including the Westin) listed for sale here. If you have any questions or would like to schedule a showing to view any active real estate listings in Mammoth Lakes or June Lake, please feel free to contact me directly.